Gentle Dental Associates has provided the Ann Arbor community with dental implant service for twelve years. Dr. Debby Hwang is a board-certified periodontist with specific implant-related training. She has written a book on the subject, Implant Site Development, as well as many journal papers. Dr. Hwang is a Diplomate of the American Board of Periodontology, which covers implant certification. A happy, healthy smile from a patient is the best gift. Request an implant consultation online or call our Ann Arbor, MI dental office for an appointment! Improve biting pressure. Implants can withstand nearly the same level of pressure as healthy natural teeth. Comfort and fit. Because your replacement teeth are anchored securely to the implants in your jaw bone they can't slip. Longevity and reliability. Implants have been shown to last as long as 20 years or more. Increase self confidence. Implants function remarkably like natural teeth. Most people who get them experience a renewed sense of self confidence. One primary benefit of dental implants is that they prevent the bone loss associated with lost teeth. This is important for many reasons; one being that bone loss leads to premature aging of the face. 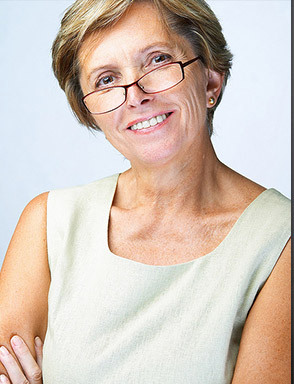 Implants will help a person retain their youthful look. Dental implants are titanium anchors placed in the bone that can support artificial teeth or dentures making them excellent long-term replacements for missing teeth. This also makes them the most cost-effective treatment for replacing teeth in the long-term. Implants require the same oral care as other teeth (brushing and flossing). In the healthy patient, implants can last for the rest of the patient’s life. A particular regimen of medications will be prescribed to minimize recovery time. We conduct a thorough review of patient medical history, dental needs, and patient desires at our consult appointment to determine the best and most affordable plan of action. A consult with our implant specialist Dr. Hwang will determine your eligibility for this treatment. 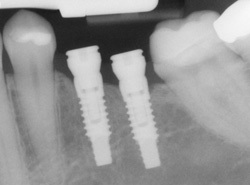 Implant success depends on the patient’s medical and dental health as well as the anatomy of the jaw. Implants may be placed either all at once or over time. The patient and his or her implant team will come up with the best plan. Implant treatment may involve several appointments. The implant placement procedure, depending on the number of fixtures to be placed, may last for at least one hour. Conscious sedation (laughing gas or oral tablets) may be used to ease the patient experience during implant therapy. As long as the patient takes his or her prescribed medications and follows post-surgical instructions after the implant procedure, recovery time may be brief. The patient may return to work the same day. To learn more about replacing a missing tooth listen to our interviews with Dr. Newman that aired March 14th and 21st on the Smile Files or call our Ann Arbor dental office to schedule an appointment. You can also read more about Dr. Debby Hwang, our resident periodontist, who performs the implant surgery.